UCF was looking to keep their winning streak alive tonight, facing off against the SMU Mustangs. The first drive of the game looked to be a little scary for the Knights as SMU marched down the field with urgency. The defense stood strong though and held SMU to three after Kevin Robledo hit a 31-yard field goal opening the scoring at 3-0 SMU. The red-hot Knights answered on the next possession on offense coming out strong with running back Adrian Killins leading the way with a big key run. Killins finished the drive off with a 15-yard touchdown run giving the Knights a 7-3 lead. On the very next kickoff UCF forced a fumble getting the ball back in the hands of Milton and the offense on the SMU 18. Milton hit Dredrick Snelson in the end zone on a 14-yard touchdown pass. This touchdown made it Milton’s 19th consecutive game with a touchdown pass. This touchdown moved the score to 14-3. After the first drive of the 1st quarter, the Knights defense was not allowing SMU to move the ball, giving the offense another opportunity to get the ball. McKenzie Milton would hit Tre Nixon for a big play for 47 yards. Running back Otis Anderson then got a chance to make an impact running the ball for an 18-yard gain. The Knights gave the ball right back to Anderson in the red zone to punch the ball in for a 4-yard touchdown run making the Knights lead 21-3 going into the second quarter. SMU started the quarter looking strong again on the first drive, getting deep into UCF territory. SMU elected to go for it on 4th and 4 instead of kicking a field goal and getting points on the board. UCF’s defense made them pay for that decision with a big stop. On the very next drive Milton was picked off by Patrick Nelson who took it to UCF’s 9-yard line. The Mustangs capitalized getting their first touchdown of the game. Ben Hicks hit James Proche for a 5-yard touchdown pass making the score 21-10 with UCF still in control. The next drive UCF had a big scare after Milton was sandwiched on a 9-yard run. Milton sat out the rest of the drive as back up Darriel Mack Jr. came in. The Knights went to their big back Taj McGowan on 4 straight carries to take the Knights to the SMU 30-yard line. Matthew Wright came in from there and buried a 45-yard field to increase the Knights lead to 24-10. 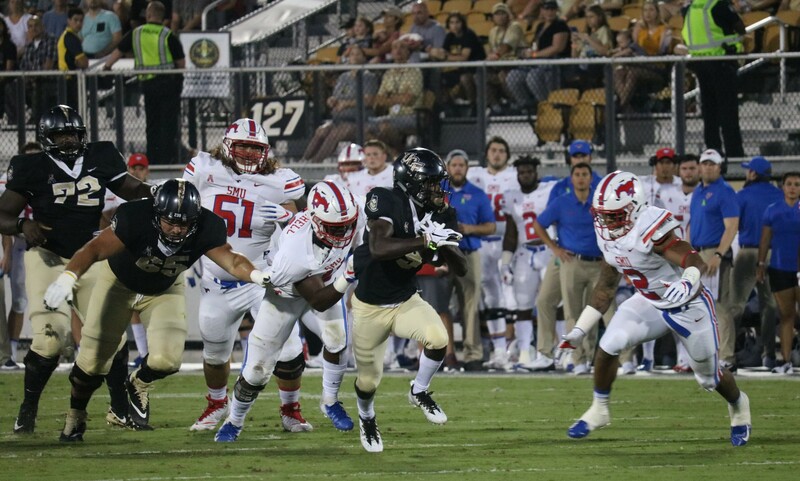 As SMU continued to struggle moving the ball on UCF’s defense the Knights offense kept getting the ball back and making them pay. Killins led the way, starting the drive off with a 26-yard run. Followed by Milton hitting Gabe Davis to set up a 34-yard field goal. Matthew Wright stayed perfect on the night making the lead 27-10. The Knights stayed hot in the second half as usual. On their first drive, Milton hit guys like Michael Colubalie and Tre Nixon for big pass plays. The Knights got into the red zone but could not convert on third down. UCF brought out the kicking team and faked the field goal on a handoff to defensive lineman Trysten Hill who took the ball in for a touchdown. After the point after by Matthew Wright, the score moved to 34-10. The following possession SMU finally began to get some momentum going as Ben Hicks threw for a couple of big plays. They couldn’t punch the ball in so the Mustangs settled for another field goal, this time from 21 yards out making the score now 34-13. UCF had a rare punt on the next drive giving the ball back to the Mustangs. SMU tried to fake punt on 4th down and were shut down by linebacker Titus Davis who delivered a huge hit to turn the ball over on downs. On the ensuing possession, Killins ended the 3rd quarter with an 18-yard run. To start the 4th quarter Milton and Nixon ended that same drive quickly with a 30-yard touchdown pass increasing the lead to 41-13 after another good extra point from Matthew Wright. The Knights defense forced yet another turnover on downs giving the offense another chance to go back to work. Gabe Davis caught another deep ball for 25 yards. Followed by a 13-yard pick up from Otis Anderson. The Knights gave the ball right back to Anderson as he took off for a 30-yard touchdown run making it 48-13. As the game was coming to a close SMU showed they weren’t ready to give up. Hicks hit his favorite receiver of the night again, Porche, for a 19-yard touchdown ending the game at 48-20. UCF had big nights from there running backs tonight. Killins who ran for 113 yards on 20 carries and a touchdown. Also, from Otis Anderson who ran for 74 yards on 6 carries with 2 touchdowns. UCF now gets ready to head to Memphis next week for a tough road game. Memphis is the favorite in the American West and it will be the first true test for the Knights. The Knights only have a 52% chance of winning which is much lower than any other game played so far, this year.